Common Opal is found in a limited number of countries. A small amount of precious Opal is found in Brazil and Mexico. 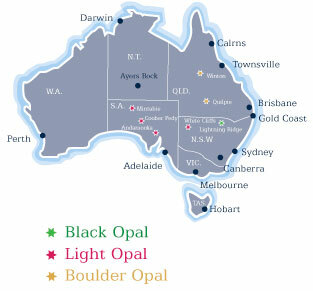 However, 96% of the worlds precious opal comes from three isolated areas in the outback of Australia. Australian stones can easily be distinguished by their brilliance and play of colour. The opal fields of Australia are in the harsh outback where only the hardened miner can make a living. Black Opal comes from Lightning Ridge in New South Wales. Light or White Opal is mined principally from the South Australian fields of Mintabie, Coober Pedy and Andamooka. Boulder Opal is from Central Queensland in the areas surrounding the townships of Quilpie and Winton.